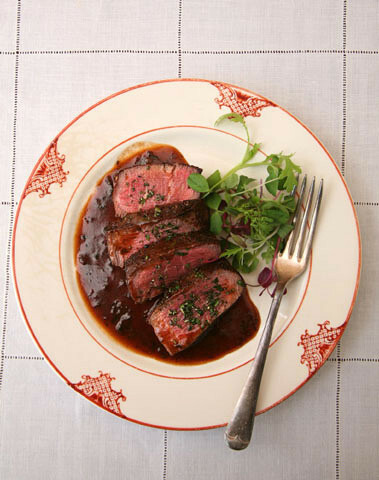 Luscious, wine-enriched bordelaise sauce is often paired with hanger steak, shell steak, and tender filet mignon. Though the sauce is traditionally served with a dollop of beef marrow, we think it is just as delicious with a garnish of chopped fresh parsley and rosemary. 1. Make the sauce: In a 2-qt. saucepan, combine wine, thyme, shallots, and bay leaf. Reduce wine over medium-high heat until almost completely evaporated. If using a gas stove, tip pan to ignite wine; this will aid in evaporation. Discard the thyme and bay leaf; stir in demi-glace. Cover, remove from heat, and set aside. 2. Prepare the filets: Heat oven to 500°. Season filets with salt and pepper. Heat oil in a 10" skillet over high heat. Sear steaks, flipping once, until browned, 4–5 minutes. Transfer skillet to oven; roast until steaks are medium rare, 4–5 minutes. Place steaks on a plate; let rest. 3. Sauce the steak: Return saucepan to medium heat. Whisk in butter. Remove saucepan from heat; stir in parsley and season sauce with salt and pepper. Transfer steaks to cutting board; add juices from plate to pan and stir. Spoon 2 tbsp. sauce onto each of 4 plates. Slice steak into ¼"-thick slices; divide between plates. Sprinkle with rosemary and thyme; drizzle each steak with 1 tbsp. sauce. Serve with baby lettuces, if you like. Yields ¾ cup sauce.